Teams should fly into San Antonio International Airport, approximately 10 minutes from the meet site. The host hotel is across the street from the meet venue. Speith equipment on all apparatus and both Speith and AAI boards at each event. All boards will stay on the apparatus assigned. There will be two sets of equipment. This is a USAG sanctioned event so only credentialed team coaches, athletes, judges, and meet officials will be allowed on the competition floor. Please remind parents and non-competing team members of this rule. Scores from each session will be posted following completion of each session as well as on www.alamoclassic.com. There will be Individual and All-Around awards presented to the athletes in each age group following each competitive session. Team: Team scores will be determined by top 3 scores per event for each team entered. Top 3 teams (max) at each level will receive a cash award (based on teams that entered into team competition for each particular session). We will also be recognizing all 2020 graduating seniors during this years’ Classic. Please ensure that they fill out the Senior Bio Form by Dec 1, 2019. The top 2 to 3 athletes, depending on the size of the session (all age groups combined), on each event in all level 9 and 10 sessions will qualify. 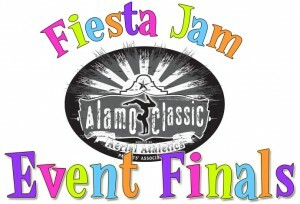 For the Fiesta Jam, athletes are limited to 2 events. Finalists will be announced following each awards ceremony. Coaches, parents, and athletes will receive info at that time including schedules. Finalists will receive additional embellishment to their Alamo Classic leotard. Alternates will also be named; they will be invited to attend in case of last-minute scratches. We are pleased to again offer drop-in child care at our KidZone during all sessions. Ages 4 (fully potty trained) through 12 years are welcome to play in our bounce houses, do arts and crafts, or just hang out with our teen helpers, all with plenty of adult supervision within the competition arena. What a low-stress way to enjoy your gymnast’s competition! The KidZone is cleared following each session to allow for cleaning and re-staffing. If staying at the host hotel, the meet venue is within walking distance. Otherwise, city garages are surrounding the convention center. Do not miss the online Pre-sale price for admission. Pre-sales will end on January 5, 2020. Purchase your tickets online and SAVE! All Alamo Classic Athletes and Coaches have free admission to all sessions. Concessions will be available at all sessions for your convenience.